This New Year’s Eve travel package is suitable for photographers of all levels and is led by professional photographer Peter Rosén who has more than 20 years of experience in professional photography. 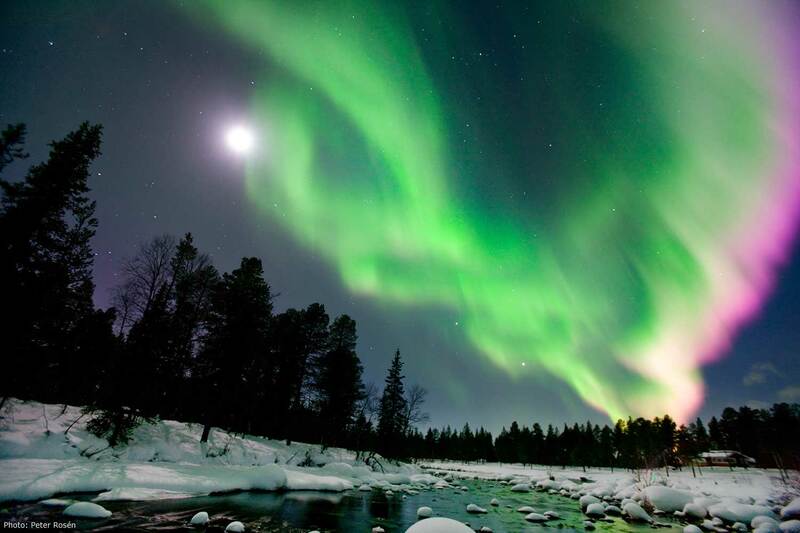 Northern lights and Swedish Lapland. 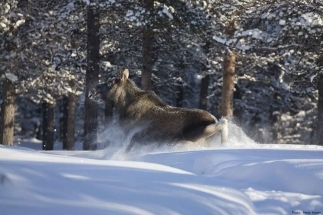 The pristine wintertime landscape, Scandinavian wildlife and Sami culture all contribute to the magic of this region. We welcome you to celebrate your New Year’s Eve holiday in a unique and relaxed way far above the Arctic Circle. Your guide will be professional photographer Peter Rosén, who has his background in biology and is associate professor in environmental science but works now as a full time photographer. He offers you an in-depth photo course on how to capture the aurora, stars, galaxies, Sámi culture, wildlife and the spellbinding midwinter landscape in the best possible way. The fleeting nature of the Northern lights means it is naturally difficult to guarantee you will see them, but to date we have been thrilled! All previous guests participating on the 3+ day tours over the past eight years have seen and captured the northern lights in beautiful environments (75 groups). The tour is part of the Canon Photography School and thanks to Canon and Manfrotto, we can offer amateur and professional SLR cameras, lenses (14-500mm), tripods, an astro star tracker – without any additional cost. 28 December – 1 January. 4 nights at Aurora Wilderness Camp next to one of the largest rivers in Sweden, the Torne River. Full board from dinner day 1 to breakfast day 5. Wine, beer or alcohol free drinks included. 5 course dinner for New Year’s Eve. Gluten free, vegetarian and vegan meals available upon request. 4 evenings with northern lights and astro photographing. 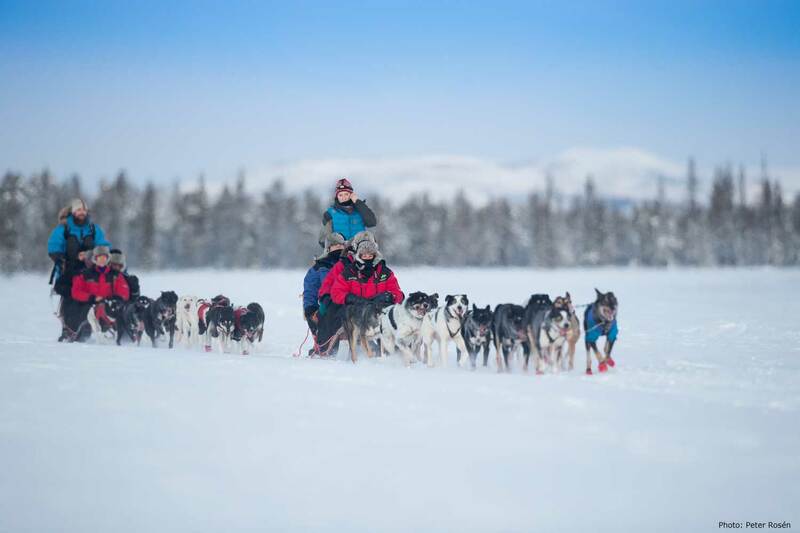 Full day dogsledding including lunch outdoors and full evening dog sledding. including night photographing. 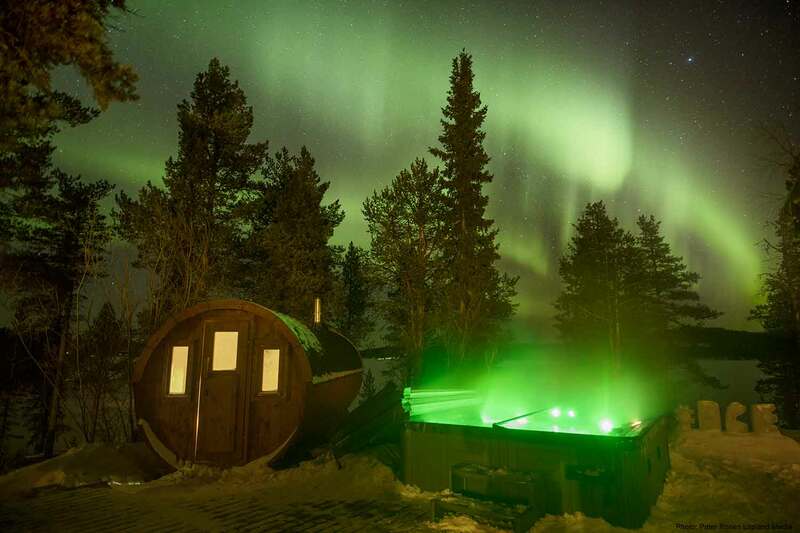 Access to an authentic wooden heated sauna and an outdoor jacuzzi. Access to an AWD minibus and snow mobile during the entire stay to increase flexibility and our chances to see nice northern lights and get the photos you are longing for. Access to Wi-Fi at the lodge. We recommend you to bring your own portable computer and your own camera. Canon SLR cameras, lenses from 14-500mm and tripods will be available as well as an astro star adventurer tracker. 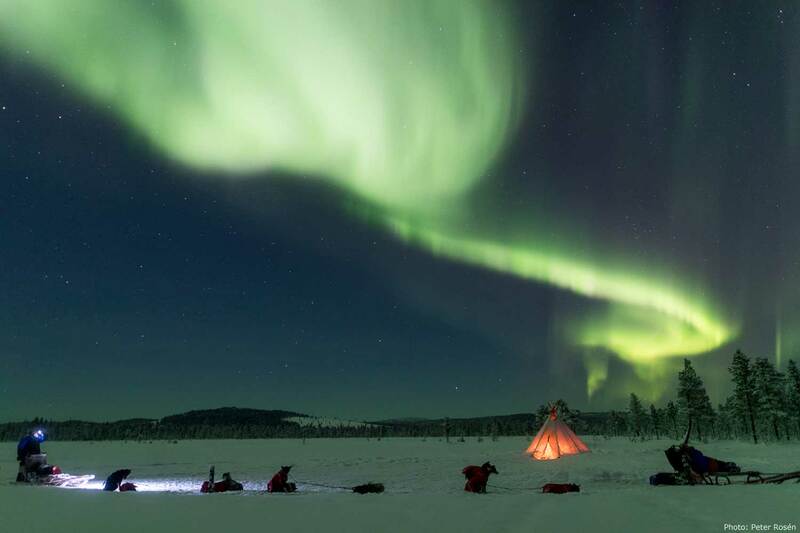 Day 1 – Lapland Landscapes and Northern Lights: After lunch we will get dressed with warm clothes and head out to Aurora Wilderness Camp where you can light a fire and settle into your cosy cabin in the forest. 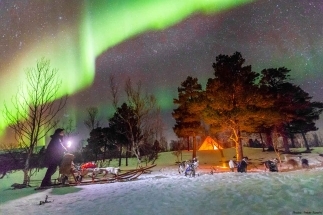 Do not expect luxury’s at the camp but beautiful views over the Torne River, the mountains and excellent spots for Northern light photographing straight from your cabin. A great place for adventures. We will use the evening light for landscape photographing from the lodge. Before dinner we will go through the basics in aurora and night photographing. After a 2 course gourmet dinner at the lodge it is time to rug up and head out for aurora hunting! We will keep an eye on the weather and the aurora forecast and we will go to whichever location will give us the best chance of seeing the Northern Lights, and we have many stunning locations to choose from. 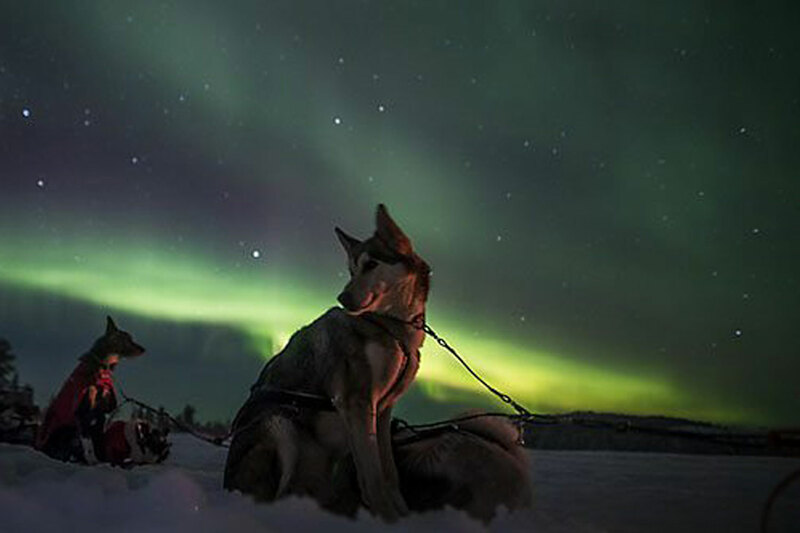 Day 2 – Dog sledding and Aurora Borealis: We start a dog sledding tour in the morning from our cabins. Our dog sledding guide will drive us into the forest and onto frozen lakes for several hours, making stops for photography along the way. Lunch outdoors over an open fire inside a lavvu (a traditional Sami teepee tent). In the afternoon we will have some free time to down load images, time for private tuition and a wooden-heated sauna. 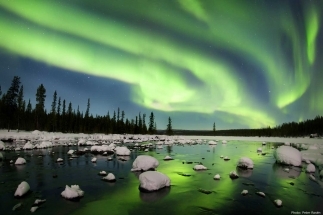 After our 2 course dinner, we will go aurora hunting, a pattern we repeat each and every night. If the Aurora comes out to dance, we are often out quite late (trust us, you will forget you are tired if you are watching the aurora). Day 4 – ICEHOTEL, landscape, New Years Eve dinner and the aurora borealis: In the morning we will visit the world famous ICEHOTEL. 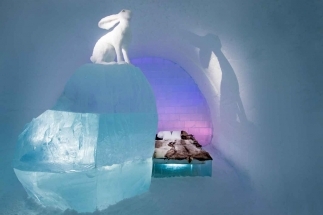 The ICEHOTEL is the world’s first hotel made of ice and snow. Founded in 1989, it is reborn in a new guise every winter, in the Swedish village of Jukkasjärvi. A very nice location for photographing! Lunch at the ICEHOTEL. In the afternoon we will have some indoor tutorial on how to process eg. Aurora and astro images. Since we only take 7 guests there is also plenty of time for individual questions. In the evening we will have a New Years Eve 3 course dinner including wine, beer or soft drinks. At night time we will hopefully celebrate the New Year with a nice Aurora dancing for us (better than any man made fire works). Day 5 – Departure day: After dragging ourselves out of bed and having breakfast, you depart at a civilized mid-morning time to Kiruna for some shopping, visiting the church in Kiruna and then to the airport or your hotel in Kiruna. You may like to spend more time in Kiruna or Stockholm, or stop over at one of the many wonderful European destinations close-by on your way home. By now you will want to sleep for a million years, but you will not be able to wipe the smile from your face. We recommend you to have your departure flight earliest around lunch time. Aurora and night photographing every night with professional photographer Peter Rosén. Dog sledding, day visit to the ICEHOTEL, moose, landscape and astro photographing. Maximum 7 participants for a genuine experience. Access to a AWD minibus and a snow mobile during your entire stay to increase our flexibility and your chances to see the Aurora. Accommodation in a remote and very beautiful location next to the Torne River. The place has been chosen so you can see and photograph the Aurora from your cabin. 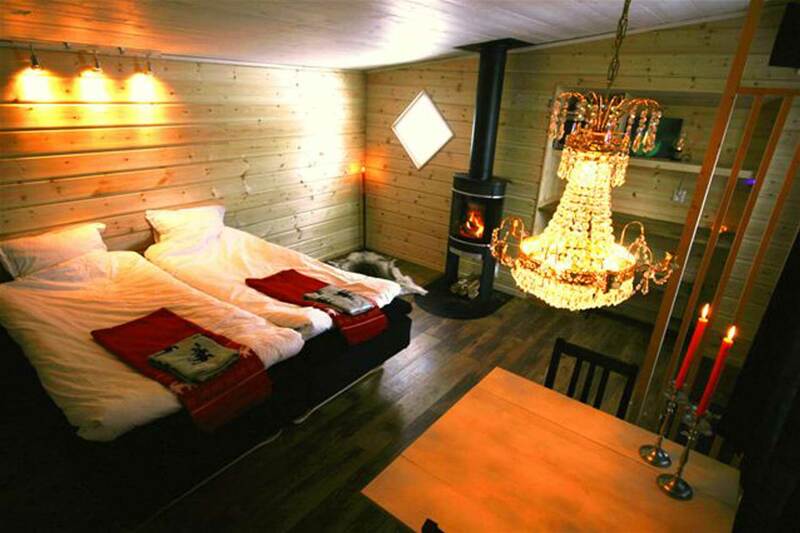 Your accommodation is next to one of the largest rivers in Sweden, the Torne River. You will go dog sledding through ancient forests and tundra both day and evening time and more. Our focus is utmost quality, which we obtain by devoting ourselves to small groups. Learning the art of wilderness, night time and Aurora photography requires close tutoring, which is exactly what we offer.